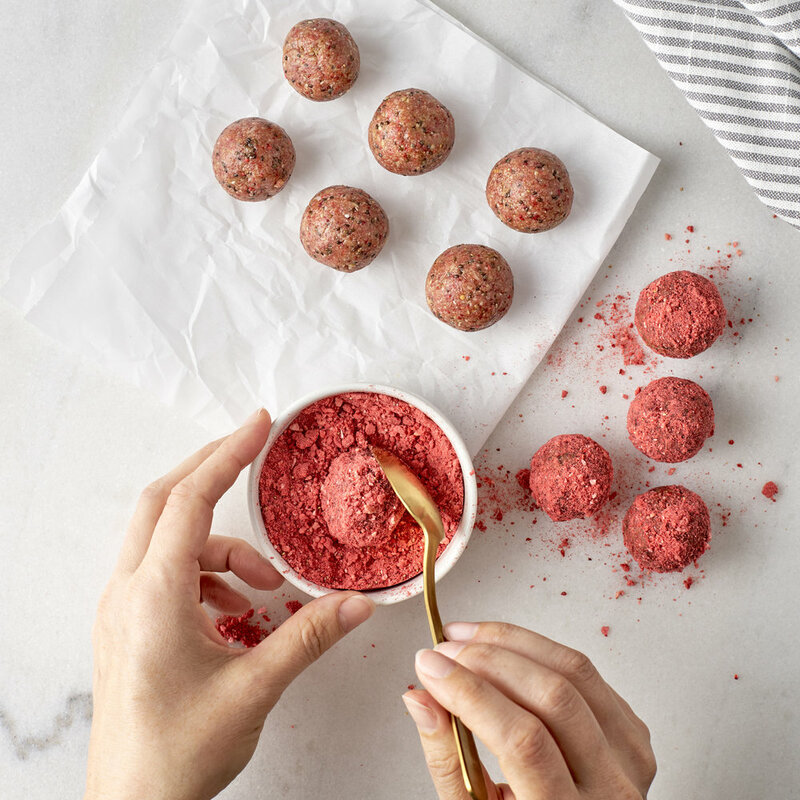 Quite possibly the easiest thing on the planet to make, energy balls require little more than some simple ingredients and your hands (if you have a food processor all the better!). No cooking or baking required! These little round wonders look a little like truffles, but unlike candy, they're made specifically to help fill you up with whole grains, nuts, and seeds. There are hundreds upon hundreds of recipes out there, but basically the key is balancing your wet ingredients with your dry to come up with something that will hold together much like a cookie dough. Pick a combination of your favorite dry ingredients, and mix with some favorite wet ingredients till you get a pliable dough. Roll into a ball, coat with cocoa powder, pulverized freeze-dried fruit, or seeds for a fun topping, or leave them plain and simple. Pop them in the fridge to cool and harden and then store in a baggy or glass container with a lid. These will keep the freezer for months, or the fridge for a few weeks. Easy to make and convenient too, these babies can be a real life saver. Combine your ingredients by hand, or use a food processor and process until the ingredients are well-mixed and they form a sticky dough. If your mix is too dry, add more a little at a time from your wet ingredients. Too wet? Add more dry ingredients. It's as simple as that! This makes a great holiday gift for your vegan friends, and it’s a good present to take to a party. Happy Holidays!! !